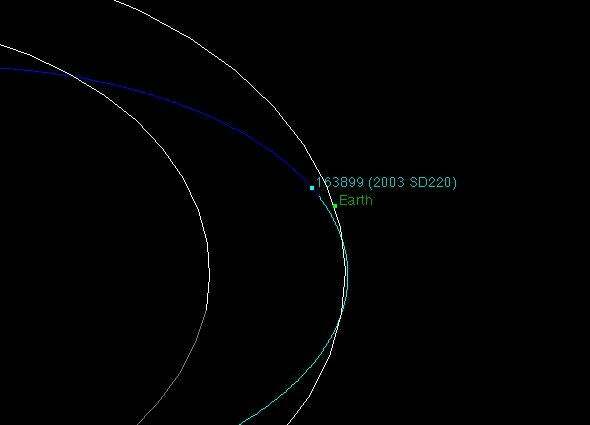 Asteroid 2003 SD220 passes Earth on Christmas Eve. 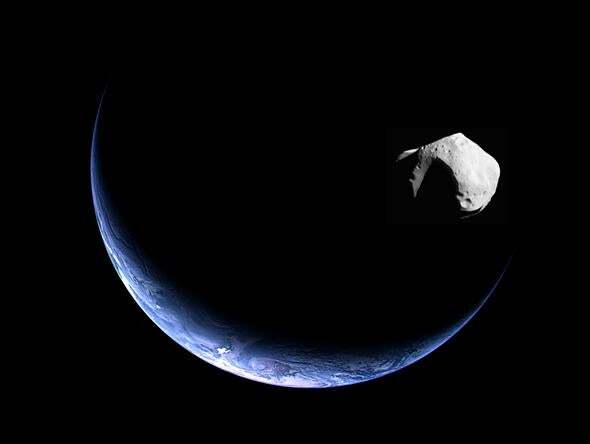 Artwork depicting a near-Earth asteroid pass, using real images of Earth and the asteroid Mathilde. Hopefully you know the drill by now. Go find a bull facing north. Walk around it to the end facing south. See what comes out of there? This story. As usual, at least part of the story is based on reality, but only a part. The asteroid is real, but not at all like you’ll hear it described by the doom-mongers. It’s called 2003 SD220, and it’s on an orbit that brings it a little closer to the Sun than Venus, and as far as just outside Earth’s orbit. Its orbit doesn’t physically cross Earth’s, but it does approach relatively close as these things go. On Thursday, just after 1 p.m. UTC, it’ll reach perigee (closest approach to Earth) at a distance of about 11 million kilometers. Right away we can see that this doomsday story is baloney. Eleven million km is a long way, almost 30 times farther away than the Moon! It’ll be so far away that it will be invisible to the naked eye, and you’ll need a decent telescope to see it at all. But it gets sillier. The asteroid was discovered in 2003 (hence the name), and gets close to us quite often. That allows astronomers a really good chance to study it, including using radar. Radar images of 203 SD220 taken over three days in December. It’s highly elongated, spins once per week, and is about 2 km long. The image above was made using the Arecibo radio telescope and indicates the asteroid is about 2 km long. That’s pretty big for a near-Earth asteroid, but let’s put that in perspective. The Earth’s Moon is 30 times closer, 1,000 times larger across, and something like a billion times this asteroid’s mass. A billion. So if the Moon doesn’t cause catastrophic earthquakes—and it doesn’t—then this asteroid couldn’t cause a tremor in a mosquito’s wing. It certainly won’t hit us, and there’s no way it can cause earthquakes. Mind you, asteroids this size pass us relatively often with no effects. And also note that every time one does there are a flurry of breathless, conspiratorial articles on dodgy websites and YouTube videos made by people with user names like “antinasa illuminati shadowgovernment 1994,” which shouldn’t invoke a lot of confidence, either. Oh, and another thing? Those videos and articles are always wrong. Like with 2005 YU55, 2007 TU24, 1950 DA, 2012 DA14, 2014 UR116, and so many others. Remember when those rocks hit the Earth? No? That’s because they didn’t. And no, astronomers don’t cover up potentially dangerous asteroids, either. Heck, we have a category of such objects called Potentially Hazardous Asteroids, and you can find a list of them online. The orbit of SD220 takes it relatively close to Earth; this diagram shows closest apprach (11 million km) on Dec. 24, 2015. The change in color from dark to light blue in the orbit is where it crosses the plane of Earth’s orbit. It really bugs me when these less-than-stellar sites talk about doom and gloom from near-passes of asteroids, for many reasons. One is simply that it’s garbage, and it steams me when people abuse astronomy. Second is that it scares people; I get email and tagged on lots of social media from folks who hear about these objects and get worried. Scaring them for giggles (or for clicks) is just downright evil. And third, it diminishes the actual amazing nature of these objects. For example, observations of SD220 indicates it’s an S-type asteroid, meaning silicaceous, or, in plain terms, stony. These generally orbit the Sun in the inner asteroid belt, outside of the orbit of Mars. Why is this one in an orbit so different? Did an encounter with Mars or Jupiter send it inward, then a pass of Earth and/or Venus alter it again to put it where it is now? Iron asteroids are made of material probably once deep inside a large, protoplanetary-sized object that got shattered by a huge impact. Many rocky asteroids are made from material that were from the outer (mantle/crustal) regions, and some asteroids come from the core/mantle boundary of such objects. When that last kind fall to Earth as meteorites, we get some of the most beautiful specimens we have. How cool is that? The lesson here is that specific asteroid threats are unlikely to be reported accurately by random people on YouTube or on websites that are pretty free with printing words in all caps. Your best bet is to stick with actual astronomers, actual scientists … trust me, we’ll let you know if there’s any danger from incoming rocks. We’ve done it before (more than once actually), and we’ll do it again. Let’s hope we won’t have to.